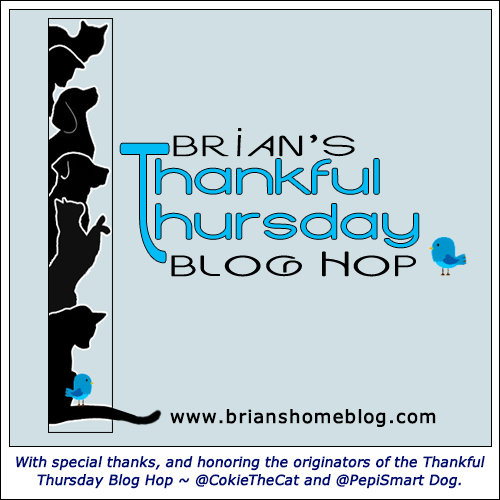 The Thankful Thursday Blog Hop is hosted by Brian from Brian’s Home. He encourages us to say what we are thankful for today. Today I had an appointment with my podiatrist. She helps me so much with managing diabetic issues, and everyone in the office tries to make the clients feel well. So it was very much worth getting up early! Today the window cleaners came and, well, cleaned the windows. One, I am very thankful for the help. Two, I am very thankful that we have the money to get this help. Three, I am very thankful that this is the only help I need at the moment, and this makes me proud. So, today was full of thankfuls! Today was the first time in three weeks I was able to attend our OT relaxation group. I needed a week of at the beginning of March, then our therapist was ill, carneval was celebrated and so on. I wasn’t sure how it would go after a few weeks without practice, but everything was fine, my body remembered quite well how to calm down. And spending one and a half hour on relaxing and a imaginary journey was just what I needed, I felt calm and centered afterwards. So I am very thankful for that! It may sound very trivial, but today I am thankful for lots of quiet time. After a very stressful weekend I decided I needed some time for myself. And it paid off, because today was the first day I feel much better, my energy returns and I am more optimistic. Today I am very thankful for my pain doctor. She always tries to improve my quality of life and always offers good advice. Not every doctor is so mindful and tries to see the world through her patient’s eyes! I am so grateful for my husband. He didn’t just insist on having a birthday party, he is also very considerate of my feelings and my lack of energy. Another thing I am thankful for is OT today, I was able to spend one and a half hours relaxing. I needed this so much!